Have you ever been intimidated by a book? It happens to me quite often. I've blogged before about Shakespeare and the Bible and they were probably the most difficult. I just find it so hard not to be influenced by outside opinion...but there's an awful lot of outside opinion. On the one hand, if it's a critical masterpiece, I think I'll look like the world's biggest idiot if I come down on it. On the other hand, it could be a little too easy to tear something apart because it's popular. It's very hard not to be biased in some direction. This collection also had me worried. Look closely at the cover. See why? That's right. 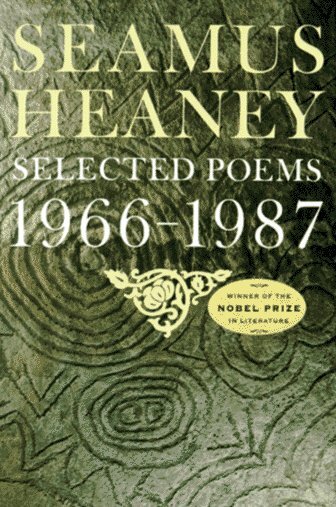 Heaney won the Nobel Prize in Literature. That's a big deal, isn't it? Don't get me wrong. I know there's politics and all that involved in any award, but the Nobel? It's safe to say that if I don't like these poems, I'm in the minority of critics. Fortunately, I'm liking Heaney's poems so far. With such accolades, I was expecting to find all sorts of words like "ephemeral" and "ethereal" and other big poem words I've never quite gotten a handle on. That's not the case. Heaney's poems are quite down to Earth. Even literally. Hmmm. Well, what I mean is, they seem to revolve around earth (lowercase e). The very first poem (which I was surprised to find that I had read before) was called "Digging" and drew comparisons between the work of a poet and a farmer. But the dirt imagery didn't stop there. Other poems mention sods, fungus, ploughs, roots, and so forth. It's nature I haven't seen a lot of in poetry. I've read a lot about mountains, trees, flowers, skies and oceans, but there's something more fertile about Heaney's writing and the ground itself seems like an obvious source of poetic inspiration. It's that "obviousness" which shows Heaney's skill. Like a professional figure skater, he has the ability to make his craft seem easy- but then you try a triple axle and fall flat on your...face. I am constantly intimidated by books. However, I work in Neuroscience and am an idiot, so I have a ready excuse. Idiot and you work in neuroscience? Is that an oxymoron? It should be an oxymoron, but I've been faking my understanding of the subject all these years. One of these days they are going to find out and fire me. Chances are everyone around you feels the same way about themselves(but they just don't admit it). I think everyone feels fraudulent at times.